Being a pet owner on a budget can be a struggle. We want to provide the best quality products for our dogs, but better the product, the more expensive it is. This is especially true with pet food. Homemade dog food is one of the most healthy options, and it can be done on a budget! This cheap homemade dog food recipe can get you started on the right track. It's easy to spend a fortune on dog food, especially homemade recipes. Making sure to buy the healthiest ingredients possible gets very costly. Organic, natural, high-quality ingredients are much more expensive than the low-quality options. If you follow these tips and look for cheap homemade dog food recipe options, you'll be able to make healthy, nutritious food that is catered to your dog's specific nutritional needs. First, you'll need to cook the rice according to the instructions on the box. While the rice is cooking, add the olive oil to a large pot and brown the turkey on medium heat. It will take 15-20 minutes to brown this much turkey, so you'll have time to prepare the other ingredients while you wait. Put the sweet potato in the microwave for 3.5 minutes. Once it's cooked, flip it over and cook it for another 3.5 minutes. Once it's cooled, cut the sweet potato into cubes that are bite-size for your pup. Once the turkey is completely cooked, add the cooked rice, tomato sauce, cubed sweet potato and spinach to the pot. I cover the pot and let it sit for about 2 minutes to wilt the spinach. As you'll see in my video guide above, this makes the spinach much easier to mix into this cheap homemade dog food recipe. Once the food has cooled you can serve it to your dog. The serving size for this recipe is about 1/2-3/4 cup of food per serving for every 20-25 pounds of body weight. You should feed it twice per day. For example, if you have a 40-50 pound dog, you would feed him 1-1.5 cups in the morning and 1-1.5 cups again in the evening. Remember that less active dogs and dogs with a slower metabolism won’t need to eat as much food as active dogs. 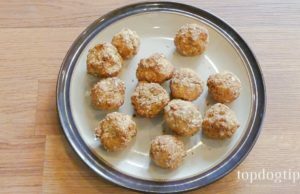 It’s best to consult your veterinarian or a canine nutritionist about the proper serving size for you pet and whether or not you should be adding any supplements to this homemade dog food for allergies recipe.